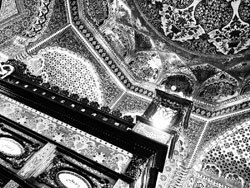 To be able to do something that Mohammad Yusuf Hussainabadi pulled off in the shape of his private museum, one needed to be possessed. That or one had to be completely mad. And he says about himself that he is both possessed and majnun (Arabic for mad). It was this same condition of the mind that had taken him walking about the villages armed with a tape recorder and notebooks to interview dozens of men who had taken part in the battle for freedom in 1947. Waqar Ali rests his head against the wall, his unruly hair blending in with the arabesques glistening off the tiles behind him. “I come here every weekend. I like the way they sing our stories,” he says, pointing in the direction of the Shah Jo Raag fakirs. For more than 250 years, Shah Abdul Latif Bhitai’s verses have echoed all around this courtyard, bringing tales of love, valour, and melancholy to all those who come for a visit. It all started in 1976 when he completed his master’s degree in Islamic studies and wanted to proceed with doctoral level studies in the subject. His elder brother told him that while his idea was admirable, he must remember that this was something thousands of other young men were doing. What was ever more important was that he do something for Balti culture and history. Strangely enough however for a young man who had already taught himself Arabic in order to fully understand the Quran, this was not disappointing. There began those long treks around Skardu to interview the survivors and unrequited heroes of the struggle against the Dogra forces of Kashmir that delivered Baltistan to the fledgling state of Pakistan. His obsessive perfectionism, sometimes, returned him to his interviewees again and again in order to get tiny details right. Thereafter he visited the sites where the battles had taken place. The result of this exercise was the Urdu title ‘Baltistan Par Aik Nazar’. Appearing in 1983, the book was an instant hit and quickly lapped up not just by Balti people, but was sold out in the bookstores of Islamabad and Lahore. Several years later, he authored another one titled ‘Tarikh e Baltistan’, a much more substantial work on the history of Baltistan from very ancient times to the modern age. The earlier work on the freedom fighters became part of this book. This book is currently in its second edition. It says much for its substantive value that it has also been translated and published in China. But, says Yusuf, it needs be remembered that he is in reality a maulvi. “At 18 I fell in love with the Quran. The prophets and walis of God had been and gone. Now all that existed as my link with my Maker was this book.” His single-minded commitment led him to teach himself Arabic at a time when this language was studied only by professional mullahs. Those were days when he worked variously as a teacher in a Skardu college, with the local government, followed by an appointment as the district project manager for Nai Roshni education scheme of the Junejo government. This long stint with the government finally ended in 2010 when he resigned from his post of district registered for the Islamabad-based Open University. Juggling his responsibilities with his research work, Yusuf was yet able to complete the first ever translation of the Quran into the Balti language. He says it was as if a divinely ordained miracle brought two young men to him shortly before he had completed editing his manuscript. The youngsters who had acquired one of the first computers in Skardu, requested him for all his composition work. Only days earlier he had received a gift of Rs 15,000 from a government functionary who had seen his monumental work in manuscript. And so the translation, started in 1987, was published in 1992. Incidentally, Arabic is not the only script Yusuf has mastered. He can read Brahmi, Devnagri, Tibetan and, most importantly, Kharoshti. Now, this last is the script that was used widely in northern cities like Taxila, Swat and Pushkalavati for writing all dialects of northern languages. The ability to decipher this script makes Yusuf Hussainabadi the last surviving reader of a forgotten form of writing. 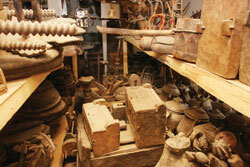 The crowning glory of his sixty-four years of life is the small museum that is taking shape under his watchful eye. Just outside Skardu, in his birthplace Hussainabad he has a property where Yusuf built a little getaway home with a couple of rooms, a kitchenette and a servant’s room. Smothered with creepers, trees and flowering shrubs this was his little haven where he could get away from the hubbub of town to spend quiet hours reading. But soon others like him who needed a pretty place to escape to, began using his property as a park. The crowds of visitors disturbed his peace and so he decided to turn the place into a museum. Last June, a new construction of a hall twelve metres by eight was in rapid progress to properly display a collection then crammed into what had once been Yusuf’s bedroom. Though the collection began as recently as 2007, the idea for it may have lain barely recognised in Yusuf’s mind since as early as 1970. Only two years earlier, the jeep road pushed through the Indus Gorge reached Skardu and for the first time outsiders started to come to this remote little town in numbers. Ten years later the road was widened to bring in lorries and the number of visitors increased. But the floodgates were opened when the road was tarmacked in 1985. Pathan dealers who had experience of selling artefacts from Swat, Chitral and other parts of the province, streamed into Skardu to roam around the countryside lapping up everything that looked ancient. As replacement they offered the simple villagers cheap and trashy modern alternates. 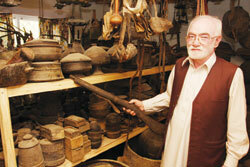 Yusuf saw vast loads of Balti handicrafts; ancient weaponry and other items of everyday use disappear down the new road. In 2007, when he juggled his time between the Open University and the first ever English medium school of Baltistan run by his family (since 1992), he thought of collecting what little had been left behind in remote villages of Baltistan. The sole idea was to preserve Balti culture for the future. “This was a vital need for Baltistan and for the future generations. Right now people do not realise how important it is for them to understand their history and culture. Years from now, when they do, this little museum will be their source of inspiration and knowledge,” says Yusuf. Once again, as he had travelled to dozens of villages to interview freedom fighters, he now undertook another yatra. This time he went asking for anything and everything families held in their storerooms that had once been in common use but was no longer so. He quickly realised that the Pathan visitations of the past decades had changed the perspective drastically. 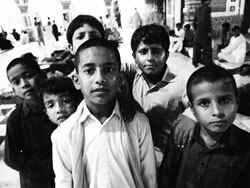 Now there was no longer the innocence that the Pathan dealers had used to their own advantage. Now even the simplest villager in the remotest village of Baltistan understood that the stone cooking pot or old wooden slippers he held in a dusty and forgotten wooden cabinet were worth several thousand rupees. Over the five years beginning 2007, Yusuf spent Rs 2.5 million to assemble together a fantastically fascinating collection of Balti artefacts. The 1,675 pieces in his assortment range over everything the Baltis used before moving on to aluminium pots, steel spades, plastic shoes and nylon clothing. Here are stone oil burning lamps, iron swords, leather buckets, brass pots and even a wooden staff said to be a copy of Moses’ staff and used for driving out evil spirits. The collection is as interesting as it is amazing. It is a remarkable effort on the part of a single individual and a mark of extreme commitment to an idea. The museum that Yusuf Hussainabadi has so painstakingly assembled together is a one-room history and anthropology class that elucidates the course of two thousand years of evolution of human society in Baltistan. Indeed, it is the only complete Balti chronology under one roof. The nearly seven hundred books and assorted manuscripts are besides these artefacts to make the study ever more replete. When the display is moved to the new hall that was coming up in June 2012, there will be a visitor’s fee. Though that will not be much, but the establishment has to get something in order to keep the place self-sustaining. Yusuf is steadfast against ever requesting or receiving government grants for his museum. For the former one must bow and scrape and for the latter forever remain subservient to government directives. In the meantime, Yusuf is hard at work preparing a catalogue of the collection. No simple index will this be, however. Besides placing the object in its correct chronology, it will detail the use of the item. However, Yusuf is not sure if this private museum will survive to the year 2112. “None of us who are alive today in my family will be around in that year. My grandsons might have some interest in my work, but after that everything is uncertain,” he says. And so he has instructed his sons that if they ever begin to lose interest, the collection should be made over to a museum in the West. He is unsure that the collection will survive the greed of rapacious civil servants and politicians in a Pakistani museum. Tailpiece: The oldest relic in the collection of Yusuf Hussainabadi is a small statuette of the Buddha in meditation. Recovered from Khaplu, this is unique because most sculptures found in Baltistan are in soft soapstone; this is in hard stone. The reverse of the piece is carved with the image of a dagger and printed with the word ‘Eeday’. Now, Brahmi was the script used in Baltistan before the 8th century CE when the Tibetan script replaced it. Of somewhat lesser antiquity is the stone lintel of a door jamb. On it the writing is in Tibetan script and dates to the 8th century. Colourful tassels hang off the necks of musical instruments; black threads bunched up in balls, placed next to the singers. Clad in black, they sit in a semi-circle facing the sarcophagus. They sing of legends, pose questions, and advocate defiance. Every question is aimed at the listener, each command directed at the individual. There is no intermediary. The language is malleable and shifts shape to accommodate anyone eager to pay heed. There appears little rigidity in what is being offered and even less in the manner in which it is offered. Numerous sanctuaries, such as this one, exist all across the country, where love, nostalgia, succour, music, and, perhaps most importantly, relief from being constantly judged for one’s religion, ethnicity, gender, caste and creed abound. You are allowed to make of it what you will and are permitted to answer any query addressed to you in your own unique way. For many, this place is their only refuge. Unfortunately, for countless individuals like Waqar Ali, this private and personal public space is under threat. 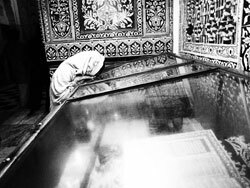 Targeted by those who consider everything other than their own view of the temporal and the spiritual as blasphemy, these places have become symbols for all that has ostensibly gone wrong with religion. For the other, often equally self-righteous and patronizing section of society that finds the notion of faith nothing less than intellectual heresy, such places epitomize what is wrong with religion. 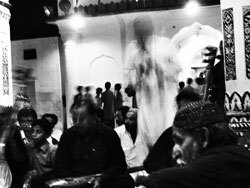 Meanwhile, within the confined space afforded him by well-wishers hell-bent on saving him from himself, Waqar Ali continues to make his weekly trips to see Shah Abdul Latif Bhitai and to hear of myths and legends. *Verse from Shah Abdul Latif Bhitai’s ‘Shah Jo Risalo’, translated by Professor D. H. Butani.